The first way to be sure your outdoor wedding is elegant is to have a backup plan if the weather isn’t participating. Think about renting a tent in Smithtown for your outdoor wedding so the event can go on rain or shine. A tent can also protect guests from the sun and create a cool, shady area. 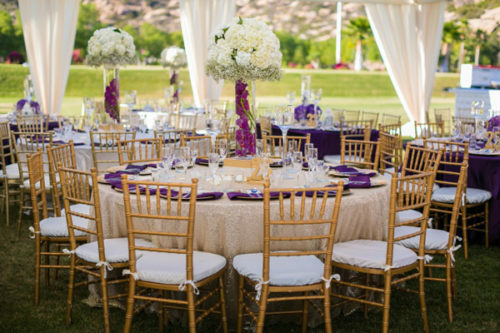 The second step in planning an elegant outdoor wedding is considering the comfort of your guests. Outdoor weddings can be hot, cold, or just right. For assistance with controlling the temperature, think about renting fans for the summer months, heaters for the winter months or a tent to offer some shade. Individuals should also consider renting a dance floor so guests can walk on a solid surface, instead of through grassy or muddy areas. The third step in planning an elegant wedding is getting sound permits and electricity generators. Some cities require sound permits for individuals who are hosting outdoor events. Check with your outdoor venue or your city to see the noise laws. Also, consider renting generators to power lighting, music, food catering devices, and more. In this modern day and age, everyone will likely have their cell phone on them at your wedding. Provide charging stations to wedding guests so they can charge their phones during the event. Even if you love the great outdoors, wind and bugs can interfere with comfort levels. Protect your wedding from bugs and wind with tent walls, mosquito spray, and citronella candles. The final step in planning a sophisticated outdoor wedding is hiring a catering staff. Outdoor food prep requires different preparation than indoor catering, so seek a company that can meet your needs. For assistance with throwing your beautiful, elegant outdoor wedding, reach out to Pink Elephant Party and Tent Rentals! We can provide clients with an endless amount of products, including tents, tables, dance floors, and more, to help make your wedding a day to remember. Learn more about our services by giving us a call at 631-357-3561.